I’ve thought of bringing and upgrading this series from the old blog for more than a year. Since the possibility of actually revisiting the interior of this venue has come up, through a contact at the Los Angeles Historic Theatre Foundation, I thought to move on it. As well, so many memories are tied to this old movie palace that not doing so would be a missed opportunity. So I’ll reprise and update series on a weekly basis during the 13th summer of the new millennium (at least while I’m still here). As some of you know, I have a thing for movies. The woman I married would exclaim, “You watch enough of them!” Fair enough. I reason it’s because I was influenced by the act of taking them in at a young age. One of my earliest remembrances was going to the drive-in with my mom and dad when I was a toddler. It’s the curse of a long memory. Subsequently, my mother’s sisters and brother would take me during my early childhood — I guess any kid-sitting, no matter if it was in a dark theater with strangers all about, was a good thing. But, it was quite a different period in Los Angeles back then. When we dumb kids — I like to think of us as precocious youth — did these things, first, from Florence and later from the blue-collar L.A. suburb of South Gate. Typically, we’d head over to rival city Huntington Park to take in movies at their theaters on Pacific boulevard. Their commercial drag was way better compared to ours. We’d watch the movies at the triumvirate venues that were the Park, California, and the Warner theaters. Heck, they even had racier fare at the old Lyric Theatre, one in the chain of Pussycat Theaters — not that they’d let us hormonal teens in to such things (ahem). We’d just stare at their movie poster cases outside. The grand lady of them, though, was the Huntington Park Warner. It was one of the classic examples of the Art Deco movie palaces strewn about the country from 1925 through the 1940’s. In this case, this was part of a chain of theaters built by the Warner Bros. studio, one of the few that survived the Depression with their theatre empires intact. 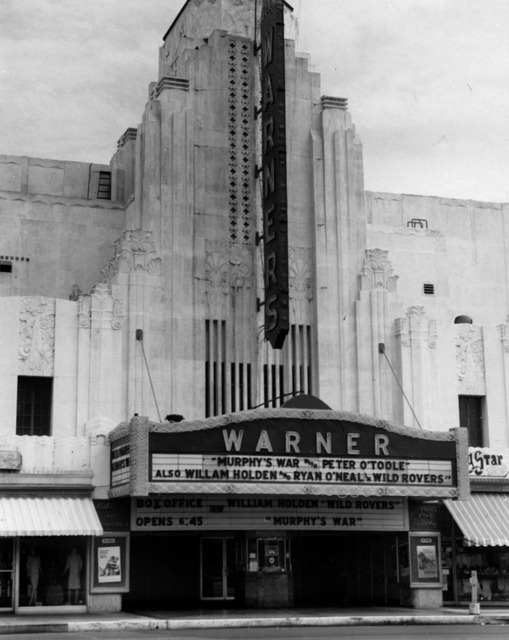 Her local sister theaters were the now demolished Warner Beverly Hills and the eternal Warner Grand in San Pedro. Yet it was at this particular theater in Huntington Park that my love of the movies was permanently etched in stone. Not only was it the closest of the art deco movie palaces in the vicinity, and the location for many of the dates in my youth, but I would later return to this same theater as an employee. I would do a stint as a projectionist during my concluding days of college. Tagged: Art Deco, Arts, California, Film, Florence, Huntington Park Warner theatre, Los Angeles, Movie palace, United States, Warner Bros.
That’s very, very kind of you to say, Paula. Love the idea, but gosh, I just wouldn’t know how to go about it. Thank you very much :-). I agree Paula, I’d love to see Michael do a documentary of this. You do write so beautifully, too! Maybe you could start by taking video of the ones that are still around and add your narrative later…? Or assemble all the still pics into an iMovie? Ooooh, great idea! Thanks, Paula. I love the Cinema Treasures web site. A nice nostalgic look at your old stomping grounds. I was also taken to the cinema when I was a todler. There were times when my parents said I watch too much then I replied it, jokingly, it’s your fault because you took me the cinema when I was little. Reading your experience, I guess it wasn’t a joke after all. Wonderful series. The Pussycat theater link (above) is dead, though. I’d love to read that article…any other sources? Thanks for the heads up and kind words. I see if I can find more info on the old Pussycat Theaters chain. Wonderful series. The link to the Pussycat Theater article is dead, though. I’d love to read it… Any other source available? I’ve fixed the link with another SD Reader article, unfortunately with a great deal of broken image links. Still, it details a lot of the history of the chain. Hope this helps :-).